1. The Rockhopper tracker above is highly accurate and updates the room and server Rockhopper was last seen in. Click here to refresh the Club Penguin Rockhopper tracker! 2. Rockhopper usually logs into the crowded servers during peak hours of the day. Rockhopper visits the less crowded servers during hours when less penguins are online. 3. Rockhopper is most commonly seen on Mammoth, Blizzard, and Frozen. Check these servers first. Rockhopper most commonly is found in the Migrator, Town, Beach, Dock, Iceberg, and Pizza Parlor. 4. Rockhopper is usually online when he visits Club Penguin, but is not on when Club Penguin support is closed. If you notice a server that usually is not crowded suddenly get crowded, check this server for Rockhopper. 5. 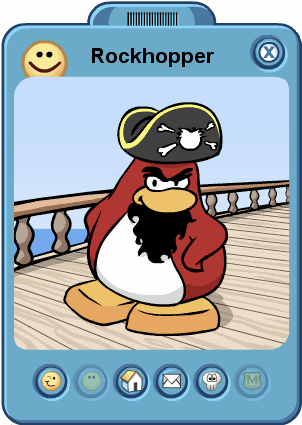 Rockhopper is a red penguin with a beard, and a black pirate hat. If you find him on Club Penguin, click on him to view his player card. 6. If you do find Rockhopper on Club Penguin, click on the free gift button on the far right for Rockhopper’s autographed background. 7. Rockhopper is always very crowded when he is online. Be sure to check the users in room list instead of searching for his in the room. The users in room list is alphabetized and easier to search through. 8. Rockhopper changes servers every 15 minutes. This means you will have to find Rockhopper fast and check this page for updates. Click on this link to refresh our Rockhopper Tracker. 9. Finding Rockhopper takes a lot of patience. Use my tracker and with some time you will find Rockhopper. Rockhopper may be on multiple servers at the same time. 10. For more info on Rockhopper Club Penguin, visit the how to find Rockhopper on Club Penguin page. 11. Visit Club Penguin Trackers for the official Rockhopper tracker. The page will load faster, so you can get into the room before it gets full. 12. Updates on Twitter will be posted whenever Rockhopper is found on Club Penguin. Follow Chrisdog93 on Twitter to receive a message whenever Rockhopper is spotted. 13. If you need anymore help finding Rockhopper, leave a comment or you can have fun tracking for Rockhopper on our Club Penguin chat!